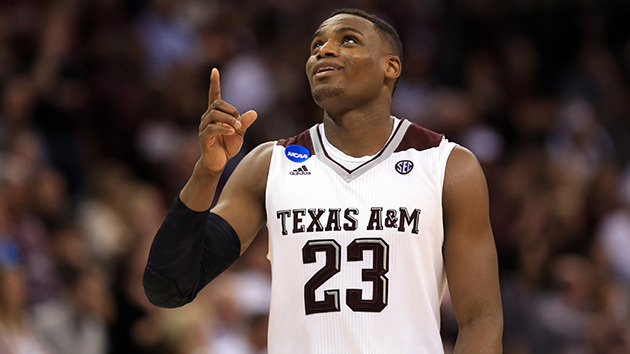 Everything you need to know about the Texas A&M Aggies as they head into the Sweet 16. The Case For: The Aggies’ boast a top-15 defense, which has been battled-tested against guard-oriented teams like Kentucky and big-time frontcourts like Vanderbilt and Gonzaga. Although they don’t rebound particularly well on that end of the floor—their defensive rate is 155th in the country—they create plenty of scoring opportunities through turnovers. They’re top-100 in block percentage, top-60 in steal percentage and top-25 in turnover percentage as a whole. On offense, the Aggies are quite efficient down to a man. The top eight players in their rotation each offer an offensive rating north of 105.0. On offense, they rack up the rebounds—40th in rebounding rate—and make opponents pay by hitting 50.7% of their two-pointers. The Aggies start three seniors and two freshmen and enter the NCAA tournament having won 10 of their past 12 games. In their most recent victory, a double-overtime contest against Northern Iowa, the Aggies were down by 12 with 38 seconds left. But they never gave up, using a stout press defense and a couple lucky breaks to tie the game by the end of regulation, marking the biggest last-minute comeback ever in college basketball. Do not count on Texas A&M to give up until the final buzzer sounds. The Case Against: Texas A&M went through a troubling stretch in late January and early February during which it lost five of six games. Worse yet, four of those losses came to teams that didn’t qualify for the Big Dance. They also had trouble winning on the road and on neutral sites, where they lost seven of their eight total in the year. The Aggies played relatively close to home for their first two tournament games, but now travel to Anaheim, Calif., and must win a pair of games there to get back to Texas. Although the comeback against the Panthers was impressive, it was troubling that a team as talented as Texas A&M would find itself in such a late hole to a mid-major team. It is hard to imagine Buddy Hield and the high-flying Sooners squandering such a large late-game lead.